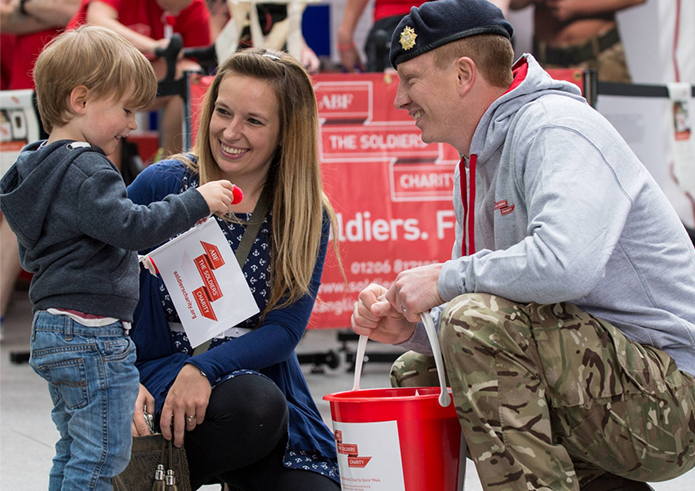 Every year thousands of supporters throughout the UK show their commitment to soldiers, veterans and their families by raising vital funds to support ABF The Soldiers’ Charity. Do you have what it takes to earn your stripes in our Fundraising Army? Whether you’re taking part in a challenge event like the Cateran Yomp, throwing yourself out of a plane at 13,000ft on a skydive, or taking part in a marathon or a sponsored cycle ride, you can climb the ranks of our Fundraising Army, earning promotions through your fundraising. Find out more about joining our Fundraising Army. Each year hundreds of incredible individuals raise thousands of pounds across the UK to support our soldiers, veterans and their families. Whatever you’ve got planned, everything you need to start your fundraising is right here. And if you don’t know what to do, we’ve got lots of exciting ideas to help you decide. One of the easiest ways to organise your own fundraiser is to hold a Big Curry – cook a delicious curry for friends, or visit your favourite curry house and get your guests to donate to the evening. Whether it’s Indian, Thai, Caribbean or your own creation, the Big Curry is a great way to get involved and support our soldiers and veterans. The support we receive from Charitable Trusts & Foundations enables us to continue our vital work. Find out more about how Trusts & Foundations support The Soldiers’ Charity. Our partnerships with corporate organisations up and down the country highlight our shared commitment to supporting soldiers, veterans and their families. Find out more about our corporate partners and how they’ve supported us.